Anti-Jewish Prejudice the Real Basis. General Belief in Efficacy of Blood. Connection with the "Slaughterer's Cut." 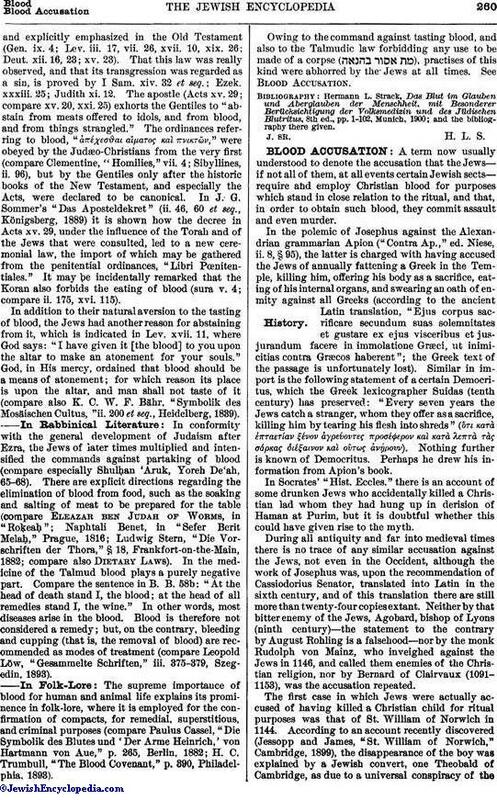 A term now usually understood to denote the accusation that the Jews—if not all of them, at all events certain Jewish sects—require and employ Christian blood for purposes which stand in close relation to the ritual, and that, in order to obtain such blood, they commit assault and even murder. In the polemic of Josephus against the Alexandrian grammarian Apion ("Contra Ap.," ed. Niese, ii. 8, § 95), the latter is charged with having accused the Jews of annually fattening a Greek in the Temple, killing him, offering his body as a sacrifice, eating of his internal organs, and swearing an oath of enmity against all Greeks (according to the ancient Latin translation, "Ejus corpus sacrificare secundum suas solemnitates et gustare ex ejus visceribus et jusjurandum facere in immolatione Græci, ut inimicitias contra Græcos haberent"; the Greek text of the passage is unfortunately lost). Similar in import is the following statement of a certain Democritus, which the Greek lexicographer Suidas (tenth century) has preserved: "Every seven years the Jews catch a stranger, whom they offer as a sacrifice, killing him by tearing his flesh into shreds" (0151τι κατὰ έπταετίαν ξένων άγρεόοντες προσέφερον καί κατὰ λεπτὰ τὰς σάρκας διέξαινον καί οὓτως ἀνῄρουν). Nothing further is known of Democritus. Perhaps he drew his information from Apion's book. In Socrates' "Hist. Eccles." there is an account of some drunken Jews who accidentally killed a Christian lad whom they had hung up in derision of Haman at Purim, but it is doubtful whether this could have given rise to the myth. During all antiquity and far into medieval times there is no trace of any similar accusation against the Jews, not even in the Occident, although the work of Josephus was, upon the recommendation of Cassiodorius Senator, translated into Latin in the sixth century, and of this translation there are still more than twenty-four copies extant. Neither by that bitter enemy of the Jews, Agobard, bishop of Lyons (ninth century)—the statement to the contrary by August Rohling is a falsehood—nor by the monk Rudolph von Mainz, who inveighed against the Jews in 1146, and called them enemies of the Christian religion, nor by Bernard of Clairvaux. (1091-1153), was the accusation repeated. The first case in which Jews were actually accused of having killed a Christian child for ritual purposes was that of St. William of Norwich in 1144. 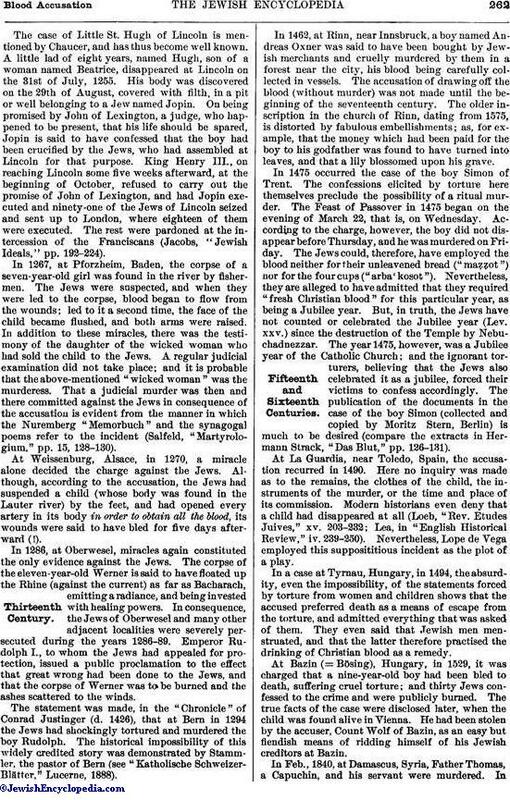 According to an account recently discovered (Jessopp and James, "St. William of Norwich," Cambridge, 1899), the disappearance of the boy was explained by a Jewish convert, one Theobald of Cambridge, as due to a universal conspiracy of theEuropean Jews, who every year cast lots where the annual sacrifice of a Christian child at Passover should take place. In the preceding year the lot had been cast at Narbonne and had fallen on Norwich. Absolutely no evidence was adduced that a murder had been committed; it seems indeed that the lad had been merely in a cataleptic fit when found, and was buried alive by his own relatives. None of the Jews were tried or punished for the alleged crime, yet the mere statement of the Cambridge convert led to the bringing of similar charges at Gloucester in 1168, at Bury St. Edmunds in 1181, and at Winchester in 1192. In none of these cases was there any trial; but popular rumor was considered sufficient to establish the martyrdom of the lads, and this proved a considerable source of attraction to the cathedrals and abbeys of these towns. In Dec., 1235, five children of a miller residing in the vicinity of the city of Fulda, Hesse-Nassau, were murdered, in consequence of which thirty-four Jews and Jewesses were slaughtered by the Crusaders. The Jews were accused of the deed, and those put to the torture are said to have confessed that they murdered the children, in order to procure their blood for purposes of healing ("ut ex eis sanguinem ad suum remedium elicerent"). It is necessary to note here (1) that the reports say nothing of the presence of witnesses; (2) that the confessions were elicited through torture, and were consequently worthless; (3) that these confessions speak only of the intention to procure a remedy ("remedium"), and contain no reference to ritualistic ceremonies; (4) that the German emperor, Frederick II., in order to sift the matter thoroughly, invited a large number of scholars and distinguished Jewish converts to Christianity from all parts of Europe, who, in answer to the question whether the Jews required Christian blood for their Passover ceremonies ("Judei Christianum sanguinem in parasceve necessarium haberent"), replied: "Neither the Old nor the New Testament states that the Jews lust for human blood: on the contrary, it is expressly stated in the Bible, in the laws of Moses, and in the Jewish ordinances designated in Hebrew as the 'Talmud,' that they should not defile themselves with blood. 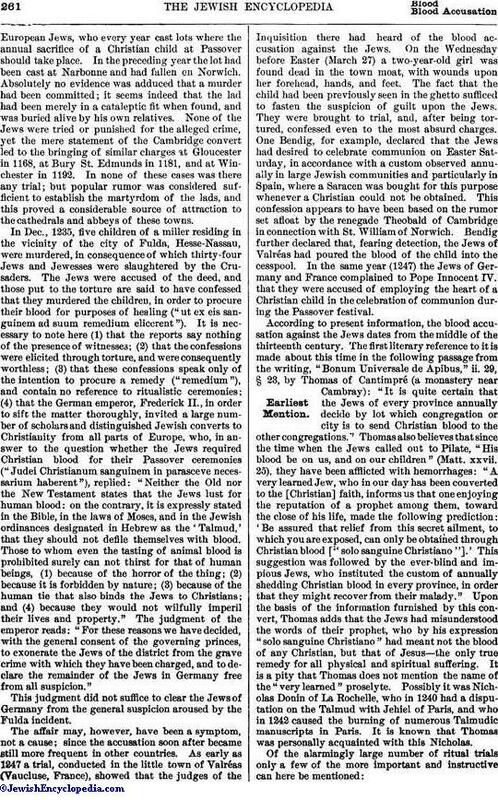 Those to whom even the tasting of animal blood is prohibited surely can not thirst for that of human beings, (1) because of the horror of the thing; (2) because it is forbidden by nature; (3) because of the human tie that also binds the Jews to Christians; and (4) because they would not wilfully imperil their lives and property." The judgment of the emperor reads: "For these reasons we have decided, with the general consent of the governing princes, to exonerate the Jews of the district from the grave crime with which they have been charged, and to declare the remainder of the Jews in Germany free from all suspicion." This judgment did not suffice to clear the Jews of Germany from the general suspicion aroused by the Fulda incident. The affair may, however, have been a symptom, not a cause; since the accusation soon after became still more frequent in other countries. As early as 1247 a trial, conducted in the little town of Valréas (Vaucluse, France), showed that the judges of the Inquisition there had heard of the blood accusation against the Jews. On the Wednesday before Easter (March 27) a two-year-old girl was found dead in the town moat, with wounds upon her forehead, hands, and feet. The fact that the child had been previously seen in the ghetto sufficed to fasten the suspicion of guilt upon the Jews. They were brought to trial, and, after being tortured, confessed even to the most absurd charges. One Bendig, for example, declared that the Jews had desired to celebrate communion on Easter Saturday, in accordance with a custom observed annually in large Jewish communities and particularly in Spain, where a Saracen was bought for this purpose whenever a Christian could not be obtained. This confession appears to have been based on the rumor set afloat by the renegade Theobald of Cambridge in connection with St. William of Norwich. Bendig further declared that, fearing detection, the Jews of Valréas had poured the blood of the child into the cesspool. In the same year (1247) the Jews of Germany and France complained to Pope Innocent IV. that they were accused of employing the heart of a Christian child in the celebration of communion during the Passover festival. According to present information, the blood accusation against the Jews dates from the middle of the thirteenth century. The first literary reference to it is made about this time in the following passage from the writing, "Bonum Universale de Apibus," ii. 29, § 23, by Thomas of Cantimpré (a monastery near Cambray): "It is quite certain that the Jews of every province annually decide by lot which congregation or city is to send Christian blood to the other congregations." Thomas also believes that since the time when the Jews called out to Pilate, "His blood be on us, and on our children" (Matt. xxvii. 25), they have been afflicted with hemorrhages: "A very learned Jew, who in our day has been converted to the [Christian] faith, informs us that one enjoying the reputation of a prophet among them, toward the close of his life, made the following prediction: 'Be assured that relief from this secret ailment, to which you are exposed, can only be obtained through Christian blood ["solo sanguine Christiano"].' This suggestion was followed by the ever-blind and impious Jews, who instituted the custom of annually shedding Christian blood in every province, in order that they might recover from their malady." Upon the basis of the information furnished by this convert, Thomas adds that the Jews had misunderstood the words of their prophet, who by his expression "solo sanguine Christiano" had meant not the blood of any Christian, but that of Jesus—the only true remedy for all physical and spiritual suffering. It is a pity that Thomas does not mention the name of the "very learned" proselyte. Possibly it was Nicholas Donin of La Rochelle, who in 1240 had a disputation on the Talmud with Jehiel of Paris, and who in 1242 caused the burning of numerous Talmudic manuscripts in Paris. It is known that Thomas was personally acquainted with this Nicholas. The case of Little St. Hugh of Lincoln is mentioned by Chaucer, and has thus become well known. A little lad of eight years, named Hugh, son of a woman named Beatrice, disappeared at Lincoln on the 31st of July, 1255. His body was discovered on the 29th of August, covered with filth, in a pit or well belonging to a Jew named Jopin. On being promised by John of Lexington, a judge, who happened to be present, that his life should be spared, Jopin is said to have confessed that the boy had been crucified by the Jews, who had assembled at Lincoln for that purpose. King Henry III., on reaching Lincoln some five weeks afterward, at the beginning of October, refused to carry out the promise of John of Lexington, and had Jopin executed and ninety-one of the Jews of Lincoln seized and sent up to London, where eighteen of them were executed. The rest were pardoned at the intercession of the Franciscans (Jacobs, "Jewish Ideals," pp. 192-224). In 1267, at Pforzheim, Baden, the corpse of a seven-year-old girl was found in the river by fishermen. The Jews were suspected, and when they were led to the corpse, blood began to flow from the wounds; led to it a second time, the face of the child became flushed, and both arms were raised. In addition to these miracles, there was the testimony of the daughter of the wicked woman who had sold the child to the Jews. A regular judicial examination did not take place; and it is probable that the above-mentioned "wicked woman" was the murderess. That a judicial murder was then and there committed against the Jews in consequence of the accusation is evident from the manner in which the Nuremberg "Memorbuch" and the synagogal poems refer to the incident (Salfeld, "Martyrologium," pp. 15, 128-130). At Weissenburg, Alsace, in 1270, a miracle alone decided the charge against the Jews. Although, according to the accusation, the Jews had suspended a child (whose body was found in the Lauter river) by the feet, and had opened every artery in its body in order to obtain all the blood, its wounds were said to have bled for five days afterward (!). In 1286, at Oberwesel, miracles again constituted the only evidence against the Jews. The corpse of the eleven-year-old Werner is said to have floated up the Rhine (against the current) as far as Bacharach, emitting a radiance, and being invested with healing powers. In consequence, the Jews of Oberwesel and many other adjacent localities were severely persecuted during the years 1286-89. Emperor Rudolph I., to whom the Jews had appealed for protection, issued a public proclamation to the effect that great wrong had been done to the Jews, and that the corpse of Werner was to be burned and the ashes scattered to the winds. The statement was made, in the "Chronicle" of Conrad Justinger (d. 1426), that at Bern in 1294 the Jews had shockingly tortured and murdered the boy Rudolph. The historical impossibility of this widely credited story was demonstrated by Stammler, the pastor of Bern (see "Katholische Schweizer-Blätter," Lucerne, 1888). In 1462, at Rinn, near Innsbruck, a boy named Andreas Oxner was said to have been bought by Jewish merchants and cruelly murdered by them in a forest near the city, his blood being carefully collected in vessels. The accusation of drawing off the blood (without murder) was not made until the beginning of the seventeenth century. The older inscription in the church of Rinn, dating from 1575, is distorted by fabulous embellishments; as, for example, that the money which had been paid for the boy to his godfather was found to have turned into leaves, and that a lily blossomed upon his grave. In 1475 occurred the case of the boy Simon of Trent. The confessions elicited by torture here themselves preclude the possibility of a ritual murder. The Feast of Passover in 1475 began on the evening of March 22, that is, on Wednesday. According to the charge, however, the boy did not disappear before Thursday, and he was murdered on Friday. The Jews could, therefore, have employed the blood neither for their unleavened bread ("maẓẓot") nor for the four cups ("arba'kosot"). Nevertheless, they are alleged to have admitted that they required "fresh Christian blood" for this particular year, as being a Jubilee year. But, in truth, the Jews have not counted or celebrated the Jubilee year (Lev. xxv.) since the destruction of the Temple by Nebuchadnezzar. The year 1475, however, was a Jubilee year of the Catholic Church; and the ignorant torturers, believing that the Jews also celebrated it as a jubilee, forced their victims to confess accordingly. The publication of the documents in the case of the boy Simon (collected and copied by Moritz Stern, Berlin) is much to be desired (compare the extracts in Hermann Strack, "Das Blut," pp. 126-131). At La Guardia, near Toledo, Spain, the accusation recurred in 1490. Here no inquiry was made as to the remains, the clothes of the child, the instruments of the murder, or the time and place of its commission. Modern historians even deny that a child had disappeared at all (Loeb, "Rev. Etudes Juives," xv. 203-232; Lea, in "English Historical Review," iv. 239-250). Nevertheless, Lope de Vega employed this supposititious incident as the plot of a play. In a case at Tyrnau, Hungary, in 1494, the absurdity, even the impossibility, of the statements forced by torture from women and children shows that the accused preferred death as a means of escape from the torture, and admitted everything that was asked of them. They even said that Jewish men menstruated, and that the latter therefore practised the drinking of Christian blood as a remedy. At Bazin (= Bösing), Hungary, in 1529, it was charged that a nine-year-old boy had been bled to death, suffering cruel torture; and thirty Jews confessed to the crime and were publicly burned. The true facts of the case were disclosed later, when the child was found alive in Vienna. He had been stolen by the accuser, Count Wolf of Bazin, as an easy but fiendish means of ridding himself of his Jewish creditors at Bazin. In Feb., 1840, at Damascus, Syria, Father Thomas, a Capuchin, and his servant were murdered. Inthis instance, also, confessions were obtained only after the infliction of barbarous tortures. 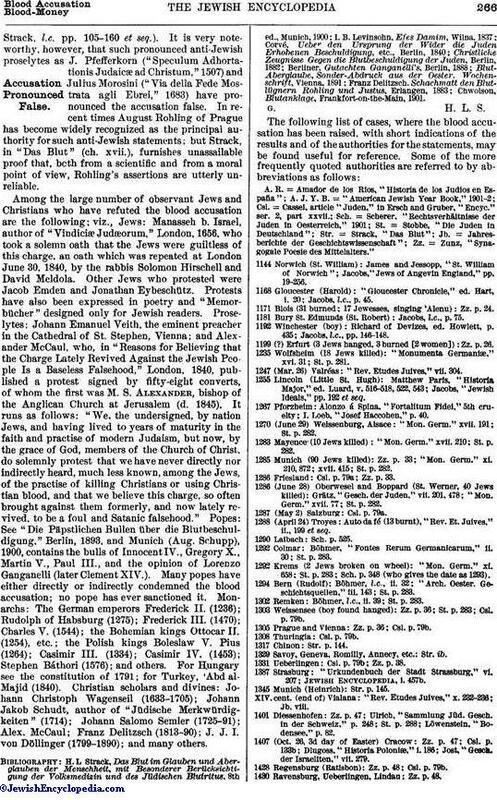 A trustworthy witness of the proceedings was the converted Jew G. W. Pieritz, who said of himself that he was no friend or defendant of rabbinism ("Persecution of the Jews at Damascus," London, 1840). See Damascus Affair. In 1882, at Tisza-Eszlàr, the victim was Esther Solymosi (compare Paul Nathan, "Der Prozess von Tisza-Eszlar," Berlin, 1892). See Tisza-Eszlár Affair. At Corfu, during the night of April 12, 1891, an eight-year-old girl was murdered. It was commonly reported that the child had been a Christian, Maria Desylla by name, and that Jews had murdered her and then taken her blood. Her teacher, however, declared, in a document attested by the French consul at Corfu, that the child's name was Rubina Sarda, and that she was a Jewess. In 1891, at Xanten, Rhenish Prussia, a butcher, Adolph Buschhoff, was accused of murdering the boy Johann Hegmann, five and one-half years of age, and of drawing and concealing his blood. The two public prosecutors, after carefully collecting all the evidence, declared that the accused could not have committed the deed, and that there was no evidence showing that blood had been concealed (see Strack, l.c. pp. 153-156). On April 1, 1899, at Polna, Bohemia, there was found in the forest near the town the body of Agnes Hruza, a seamstress, nineteen years old, with a gash in the throat. A Jew, Leopold Hilsner, an idler, twenty-three years of age, was accused of the deed, and in the same year was sentenced to death by the court at Kuttenberg for complicity in the murder. The public prosecutor, Schneider-Swoboda, and the advocate, Dr. Baxa, averred (the former indirectly, the latter openly) that a ritual murder was involved. But the medical faculty of the Czech University of Prague have demonstrated that the obtaining of blood must be excluded as a motive for the deed. 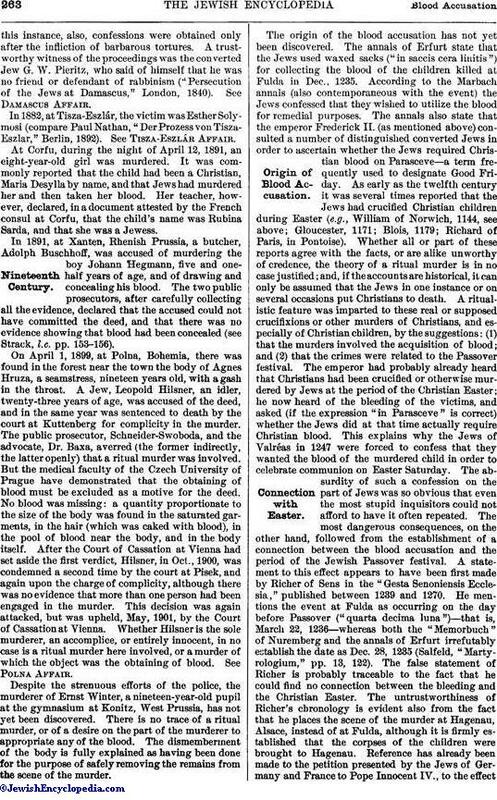 No blood was missing: a quantity proportionate to the size of the body was found in the saturated garments, in the hair (which was caked with blood), in the pool of blood near the body, and in the body itself. After the Court of Cassation at Vienna had set aside the first verdict, Hilsner, in Oct., 1900, was condemned a second time by the court at Pisek, and again upon the charge of complicity, although there was no evidence that more than one person had been engaged in the murder. This decision was again attacked, but was upheld, May, 1901, by the Court of Cassation at Vienna. Whether Hilsner is the sole murderer, an accomplice, or entirely innocent, in no case is a ritual murder here involved, or a murder of which the object was the obtaining of blood. See Polna Affair. Despite the strenuous efforts of the police, the murderer of Ernst Winter, a nineteen-year-old pupil at the gymnasium at Konitz, West Prussia, has not yet been discovered. There is no trace of a ritual murder, or of a desire on the part of the murderer to appropriate any of the blood. The dismemberment of the body is fully explained as having been done for the purpose of safely removing the remains from the scene of the murder. The origin of the blood accusation has not yet been discovered. The annals of Erfurt state that the Jews used waxed sacks ("in saccis cera linitis") for collecting the blood of the children killed at Fulda in Dec., 1235. According to the Marbach annals (also contemporaneous with the event) the Jews confessed that they wished to utilize the blood for remedial purposes. The annals also state that the emperor Frederick II. (as mentioned above) consulted a number of distinguished converted Jews in order to ascertain whether the Jews required Christian blood on Parasceve—a term frequently used to designate Good Friday. As early as the twelfth century it was several times reported that the Jews had crucified Christian children during Easter (e.g., William of Norwich, 1144, see above; Gloucester, 1171; Blois, 1179; Richard of Paris, in Pontoise). Whether all or part of these reports agree with the facts, or are alike unworthy of credence, the theory of a ritual murder is in no case justified; and, if the accounts are historical, it can only be assumed that the Jews in one instance or on several occasions put Christians to death. A ritualistic feature was imparted to these real or supposed crucifixions or other murders of Christians, and especially of Christian children, by the suggestions: (1) that the murders involved the acquisition of blood; and (2) that the crimes were related to the Passover festival. The emperor had probably already heard that Christians had been crucified or otherwise murdered by Jews at the period of the Christian Easter; he now heard of the bleeding of the victims, and asked (if the expression "in Parasceve" is correct) whether the Jews did at that time actually require Christian blood. This explains why the Jews of Valréas in 1247 were forced to confess that they wanted the blood of the murdered child in order to celebrate communion on Easter Saturday. The absurdity of such a confession on the part of Jews was so obvious that even the most stupid inquisitors could not afford to have it often repeated. The most dangerous consequences, on the other hand, followed from the establishment of a connection between the blood accusation and the period of the Jewish Passover festival. A statement to this effect appears to have been first made by Richer of Sens in the "Gesta Senoniensis Ecclesiæ," published between 1239 and 1270. He mentions the event at Fulda as occurring on the day before Passover ("quarta decima luna")—that is, March 22, 1236—whereas both the "Memorbuch" of Nuremberg and the annals of Erfurt irrefutably establish the date as Dec. 28, 1235 (Salfeld, "Martyrologium," pp. 13, 122). The false statement of Richer is probably traceable to the fact that he could find no connection between the bleeding and the Christian Easter. The untrustworthiness of Richer's chronology is evident also from the fact that he places the scene of the murder at Hagenau, Alsace, instead of at Fulda, although it is firmly established that the corpses of the children were brought to Hagenau. Reference has already been made to the petition presented by the Jews of Germany and France to Pope Innocent IV., to the effectthat they had been accused of celebrating the Feast of Passover with the heart of a murdered Christian boy, in answer to which the pope issued a bull (July 5) decreeing that the Jews should not be persecuted because of this false accusation. 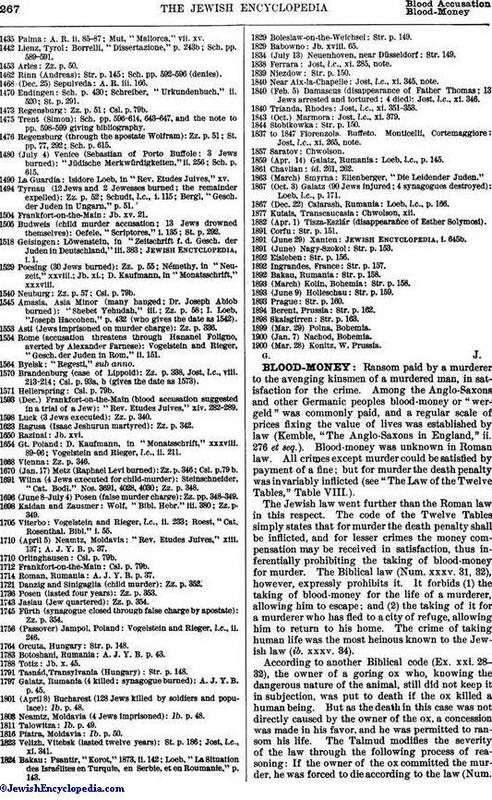 Examples of the association of ritual murders with the Feast of Passover are found as follows: at Weissensee, Thuringia, 1303; Savoy, 1329; Trent, 1475; Boleslaw, Galicia, 1829; Tarnow, Galicia, 1844; Ostrovo, in the Russian government of Lublin, 1875; Eisleben, 1892; Bakau, Rumania, 1892 (see Strack, l.c. ch. xviii.). 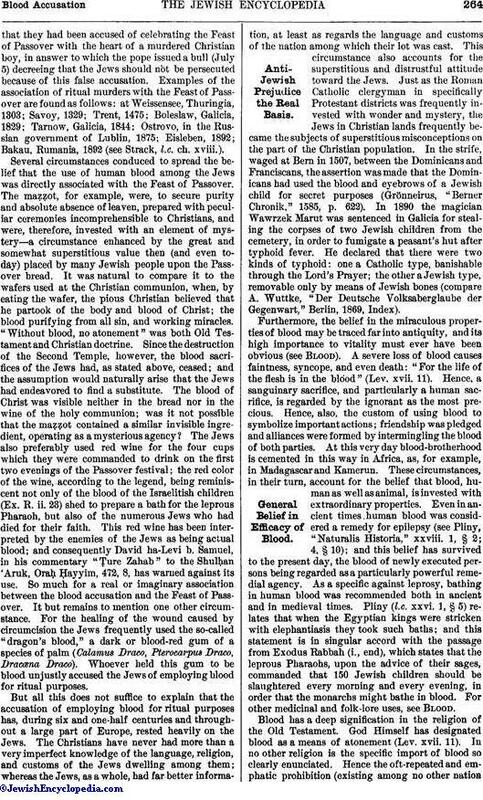 Several circumstances conduced to spread the belief that the use of human blood among the Jews was directly associated with the Feast of Passover. The maẓẓot, for example, were, to secure purity and absolute absence of leaven, prepared with peculiar ceremonies incomprehensible to Christians, and were, therefore, invested with an element of mystery—a circumstance enhanced by the great and somewhat superstitious value then (and even today) placed by many Jewish people upon the Passover bread. It was natural to compare it to the wafers used at the Christian communion, when, by eating the wafer, the pious Christian believed that he partook of the body and blood of Christ; the blood purifying from all sin, and working miracles. "Without blood, no atonement" was both Old Testament and Christian doctrine. Since the destruction of the Second Temple, however, the blood sacrifices of the Jews had, as stated above, ceased; and the assumption would naturally arise that the Jews had endeavored to find a substitute. The blood of Christ was visible neither in the bread nor in the wine of the holy communion; was it not possible that the maẓẓot contained a similar invisible ingredient, operating as a mysterious agency? The Jews also preferably used red wine for the four cups which they were commanded to drink on the first two evenings of the Passover festival; the red color of the wine, according to the legend, being reminiscent not only of the blood of the Israelitish children (Ex. R. ii. 23) shed to prepare a bath for the leprous Pharaoh, but also of the numerous Jews who had died for their faith. This red wine has been interpreted by the enemies of the Jews as being actual blood; and consequently David ha-Levi b. Samuel, in his commentary "Ṭure Zahab" to the Shulḥan 'Aruk, Oraḥ Ḥayyim, 472, 8, has warned against its use. So much for a real or imaginary association between the blood accusation and the Feast of Passover. It but remains to mention one other circumstance. For the healing of the wound caused by circumcision the Jews frequently used the so-called "dragon's blood," a dark or blood-red gum of a species of palm (Calamus Draco, Pterocarpus Draco, Dracæna Draco). Whoever held this gum to be blood unjustly accused the Jews of employing blood for ritual purposes. But all this does not suffice to explain that the accusation of employing blood for ritual purposes has, during six and one-half centuries and throughout a large part of Europe, rested heavily on the Jews. The Christians have never had more than a very imperfect knowledge of the language, religion, and customs of the Jews dwelling among them; whereas the Jews, as a whole, had far better information, at least as regards the language and customs of the nation among which their lot was cast. This circumstance also accounts for the superstitious and distrustful attitude toward the Jews. Just as the Roman Catholic clergyman in specifically Protestant districts was frequently invested with wonder and mystery, the Jews in Christian lands frequently became the subjects of superstitious misconceptions on the part of the Christian population. In the strife, waged at Bern in 1507, between the Dominicans and Franciscans, the assertion was made that the Dominicans had used the blood and eyebrows of a Jewish child for secret purposes (Grönneirus, "Berner Chronik," 1585, p. 622). In 1890 the magician Wawrzek Marut was sentenced in Galicia for stealing the corpses of two Jewish children from the cemetery, in order to fumigate a peasant's hut after typhoid fever. He declared that there were two kinds of typhoid: one a Catholic type, banishable through the Lord's Prayer; the other a Jewish type, removable only by means of Jewish bones (compare A. Wuttke, "Der Deutsche Volksaberglaube der Gegenwart," Berlin, 1869, Index). Furthermore, the belief in the miraculous properties of blood may be traced far into antiquity, and its high importance to vitality must ever have been obvious (see Blood). A severe loss of blood causes faintness, syncope, and even death: "For the life of the flesh is in the blood" (Lev. xvii. 11). Hence, a sanguinary sacrifice, and particularly a human sacrifice, is regarded by the ignorant as the most precious. Hence, also, the custom of using blood to symbolize important actions; friendship was pledged and alliances were formed by intermingling the blood of both parties. At this very day blood-brotherhood is cemented in this way in Africa, as, for example, in Madagascar and Kamerun. These circumstances, in their turn, account for the belief that blood, human as well as animal, is invested with extraordinary properties. Even in ancient times human blood was considered a remedy for epilepsy (see Pliny, "Naturalis Historia," xxviii. 1, § 2; 4, § 10); and this belief has survived to the present day, the blood of newly executed persons being regarded as a particularly powerful remedial agency. As a specific against leprosy, bathing in human blood was recommended both in ancient and in medieval times. Pliny (l.c. xxvi. 1, § 5) relates that when the Egyptian kings were stricken with elephantiasis they took such baths; and this statement is in singular accord with the passage from Exodus Rabbah (i., end), which states that the leprous Pharaohs, upon the advice of their sages, commanded that 150 Jewish children should be slaughtered every morning and every evening, in order that the monarchs might bathe in blood. For other medicinal and folk-lore uses, see Blood. Blood has a deep signification in the religion of the Old Testament. God Himself has designated blood as a means of atonement (Lev. xvii. 11.). In no other religion is the specific import of blood so clearly enunciated. Hence the oft-repeated and emphatic prohibition (existing among no other nationin such form) against the partaking of blood as food (Lev. iii. 17, vii. 26, xix. 26; Deut. xii. 16; I Sam. xiv. 32, 33; Ezek, xxxiii. 25; compare also Acts xv. 29). When with the destruction of the Second Temple the sacrifices ceased, the sprinkling of the altar with blood ceased also. But the abhorrence of the tasting of blood remained; indeed, the later Jewish legislation went even further in this respect than that of the Old Testament (see Shulḥan 'Aruk, Yoreh De'ah, 65, 1; 67, 1, 39; Eleazar of Worms, in "Roḳeaḥ"; Naphtali Benedict, in "Sefer Berith Melaḥ," Prague, 1816; S. B. Bamberger, "Amirah Lebet Ya'akob," 2d ed., Fürth, 1864). Another important principle of the Jewish law reads: (any utilization of a dead body is forbidden; 'Abodah Zarah 29b; compare J. Rabbinowicz, "Der Todtencultus bei den Juden," Frankfort-on-the-Main, 1889, §§ 21-23). Both these sets of laws have constituted and still constitute a serious impediment to the inception and furtherance among the Jews of those ideas on blood and its applications that are found among other nations. Superstition, it is true, exists among the Jews; and there are also superstitions Jewish in origin. 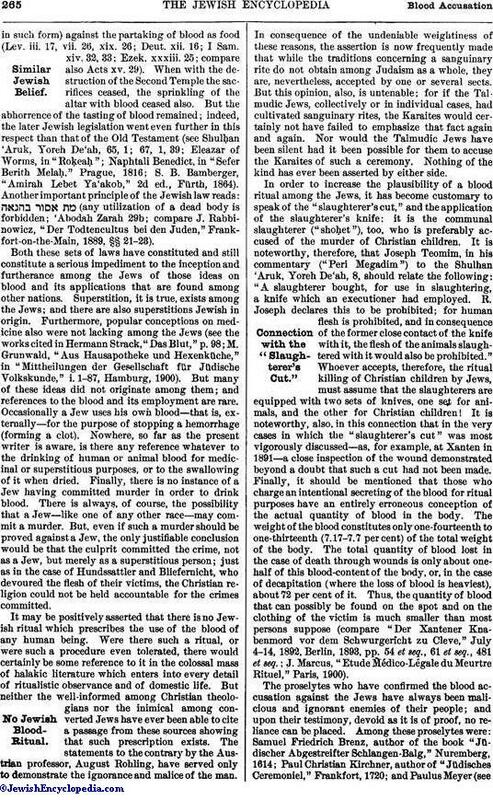 Furthermore, popular conceptions on medicine also were not lacking among the Jews (see the works cited in Hermann Strack, "Das Blut," p. 98; M. Grunwald," Aus Hausapotheke und Hexenküche," in "Mittheilungen der Gesellschaft für Jüdische Volkskunde," i. 1-87, Hamburg, 1900). But many of these ideas did not originate among them; and references to the blood and its employment are rare. Occasionally a Jew uses his own blood—that is, externally—for the purpose of stopping a hemorrhage (forming a clot). Nowhere, so far as the present writer is aware, is there any reference whatever to the drinking of human or animal blood for medicinal or superstitious purposes, or to the swallowing of it when dried. Finally, there is no instance of a Jew having committed murder in order to drink blood. There is always, of course, the possibility that a Jew—like one of any other race—may commit a murder. But, even if such a murder should be proved against a Jew, the only justifiable conclusion would be that the culprit committed the crime, not as a Jew, but merely as a superstitious person; just as in the case of Hundssattler and Bliefernicht, who devoured the flesh of their victims, the Christian religion could not be held accountable for the crimes committed. It may be positively asserted that there is no Jewish ritual which prescribes the use of the blood of any human being. Were there such a ritual, or were such a procedure even tolerated, there would certainly be some reference to it in the colossal mass of halakic literature which enters into every detail of ritualistic observance and of domestic life. But neither the well-informed among Christian theologians nor the inimical among converted Jews have ever been able to cite a passage from these sources showing that such prescription exists. The statements to the contrary by the Austrian professor, August Rohling, have served only to demonstrate the ignorance and malice of the man. In consequence of the undeniable weightiness of these reasons, the assertion is now frequently made that while the traditions concerning a sanguinary rite do not obtain among Judaism as a whole, they are, nevertheless, accepted by one or several sects. But this opinion, also, is untenable; for if the Talmudic Jews, collectively or in individual cases, had cultivated sanguinary rites, the Karaites would certainly not have failed to emphasize that fact again and again. Nor would the Talmudic Jews have been silent had it been possible for them to accuse the Karaites of such a ceremony. Nothing of the kind has ever been asserted by either side. In order to increase the plausibility of a blood ritual among the Jews, it has become customary to speak of the "slaughterer's cut," and the application of the slaughterer's knife: it is the communal slaughterer ("shoḥet"), too, who is preferably accused of the murder of Christian children. It is noteworthy, therefore, that Joseph Teomim, in his commentary ("Peri Megadim") to the Shulḥan 'Aruk, Yoreh De'ah, 8, should relate the following: "A slaughterer bought, for use in slaughtering, a knife which an executioner had employed. R. Joseph declares this to be prohibited; for human flesh is prohibited, and in consequence of the former close contact of the knife with it, the flesh of the animals slaughtered with it would also be prohibited." Whoever accepts, therefore, the ritual killing of Christian children by Jews, must assume that the slaughterers are equipped with two sets of knives, one set for animals, and the other for Christian children! It is noteworthy, also, in this connection that in the very cases in which the "slaughterer's cut" was most vigorously discussed—as, for example, at Xanten in 1891—a close inspection of the wound demonstrated beyond a doubt that such a cut had not been made. Finally, it should be mentioned that those who charge an intentional secreting of the blood for ritual purposes have an entirely erroneous conception of the actual quantity of blood in the body. The weight of the blood constitutes only one-fourteenth to one-thirteenth (7.17-7.7 per cent) of the total weight of the body. The total quantity of blood lost in the case of death through wounds is only about one-half of this blood-content of the body, or, in the case of decapitation (where the loss of blood is heaviest), about 72 per cent of it. Thus, the quantity of blood that can possibly be found on the spot and on the clothing of the victim is much smaller than most persons suppose (compare "Der Xantener Knabenmord vor dem Schwurgericht zu Cleve," July 4-14, 1892, Berlin, 1893, pp. 54 et seq., 61 et seq., 481 et seq. ; J. Marcus, "Etude Médico-Légale du Meurtre Rituel," Paris, 1900). The proselytes who have confirmed the blood accusation against the Jews have always been malicious and ignorant enemies of their people; and upon their testimony, devoid as it is of proof, no reliance can be placed. Among these proselytes were: Samuel Friedrich Brenz, author of the book "Jüdischer Abgestreifter Schlangen-Balg," Nuremberg, 1614; Paul Christian Kirchner, author of "Jüdisches Ceremoniel," Frankfort, 1720; and Paulus Meyer (seeStrack, l.c. pp. 105-160 et seq.). It is very note-worthy, however, that such pronounced anti-Jewish proselytes as J. Pfefferkorn ("Speculum Adhortationis Judaicæ ad Christum," 1507) and Julius Morosini ("Via della Fede Mostrata agli Ebrei," 1683) have pronounced the accusation false. In recent times August Rohling of Prague has become widely recognized as the principal authority for such anti-Jewish statements; but Strack, in "Das Blut" (ch. xvii. ), furnishes unassailable proof that, both from a scientific and from a moral point of view, Rohling's assertions are utterly unreliable. Among the large number of observant Jews and Christians who have refuted the blood accusation are the following; viz., Jews: Manasseh b. Israel, author of "Vindiciæ Judæorum," London, 1656, who took a solemn oath that the Jews were guiltless of this charge, an oath which was repeated at London June 30, 1840, by the rabbis Solomon Hirschell and David Meldola. Other Jews who protested were Jacob Emden and Jonathan Eybeschütz. Protests have also been expressed in poetry and "Memorbücher" designed only for Jewish readers. Proselytes: Johann Emanuel Veith, the eminent preacher in the Cathedral of St. Stephen, Vienna; and Alexander McCaul, who, in "Reasons for Believing that the Charge Lately Revived Against the Jewish People Is a Baseless Falsehood," London, 1840, published a protest signed by fifty-eight converts, of whom the first was M. S. Alexander, bishop of the Anglican Church at Jerusalem (d. 1845). It runs as follows: "We, the undersigned, by nation Jews, and having lived to years of maturity in the faith and practise of modern Judaism, but now, by the grace of God, members of the Church of Christ, do solemnly protest that we have never directly nor indirectly heard, much less known, among the Jews, of the practise of killing Christians or using Christian blood, and that we believe this charge, so often brought against them formerly, and now lately revived, to be a foul and Satanic falsehood." Popes: See "Die Päpstlichen Bullen über die Blutbeschuldigung," Berlin, 1893, and Munich (Aug. Schupp), 1900, contains the bulls of Innocent IV., Gregory X., Martin V., Paul III., and the opinion of Lorenzo Ganganelli (later Clement XIV.). Many popes have either directly or indirectly condemned the blood accusation; no pope has ever sanctioned it. Monarchs: The German emperors Frederick II. (1236); Rudolph of Habsburg (1275); Frederick III. (1470); Charles V. (1544); the Bohemian kings Ottocar II. (1254), etc. ; the Polish kings Boleslaw V. Pius (1264); Casimir III. (1334); Casimir IV. (1453); Stephen Báthori (1576); and others. For Hungary see the constitution of 1791; for Turkey, 'Abd al-Majid (1840). Christian scholars and divines: Johann Christoph Wagenseil (1633-1705); Johann Jakob Schudt, author of "Jüdische Merkwürdigkeiten" (1714); Johann Salomo Semler (1725-91); Alex. McCaul; Franz Delitzsch (1813-90); J. J. I. von Döllinger (1799-1890); and many others. 1430 Ravensburg, Ueberlingen, Lindau: Zz. p. 48. 1435 Palma: A. R. ii. 85-87; Mut, "Mallorca," vii. xv. 1714 Roman, Rumania: A. J. Y. B. p. 37. 1783 Botoshani, Rumania: A. J. Y. B. p. 43. 1797 Galatz, Rumania (4 killed; synagogue burned): A. J. Y. B. p. 45. 1859 (Apr. 14) Galatz, Rumania: Loeb, l.c., p. 145. 1867 (Dec. 22) Calarash, Rumania: Loeb, l.c., p. 166. 1892 Bakau, Rumania: Str. p. 158. 1900 (Mar. 28) Konitz, W. Prussia.